Wine gifts are so well received and this gorgeous Wine Caddy set is no exception. 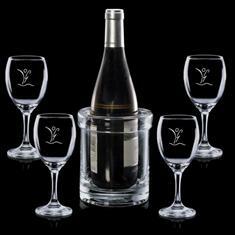 Made of a stunning 24% Lead Crystal, our Caddy comes with 4 matching Wine Glasses. Packed in a presentation gift box for added value. A gift they will surely treasure.